There's no reason to miss a good day of hunting in order to cook Thanksgiving dinner. Cartoon by Custer Cassidy. To my mind, one of the greatest culinary inventions for aiding and abetting foxhunting families has been the self-basting turkey. It most certainly has been a boon to our ménage, as Thanksgiving Day on our farm is noted for being a miracle of logistics. Not only is this holiday a fest for family and friends around the big bird, but it has also always been a major hunting day. One of the fine private packs with whom I hunt chooses Thanksgiving to mark their opening day, when one trades in ratcatcher shirt for black coat, vest and stock, and when several other private packs join in the special chase. Of course, one must not forget Thanksgiving means planning a menu that must include provisions for the anywhere from 18 to 200 people we can expect to squeeze around the table, depending on how many friends the children bring home and what relatives are in town. Not that I don’t enjoy having everyone around. I do, but as I mentioned, it is a major hunting day, which also requires an inordinate amount of preparation. All of which brings us back to the usefulness of a self-basting turkey. Of course, I realize some people do not foxhunt on Thanksgiving Day, although I have no idea what they do with all that extra time after the turkey is in the oven. I purchase only turkeys that are self-basting (sincerely waiting for the day they will also be self-stuffing). Once filled and plunked in the roasting pan, Tom Turkey must manage to cook on his own, without my stationing myself in front of the oven door to peer in the glass hourly and check on his browning progress. 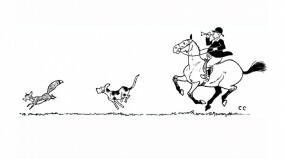 I’ve ceased trying to explain that I am not just going “riding,” but I am going foxhunting, the difference akin to jogging around the block or running a 26-mile marathon. These same relatives, as well as the rest of my family, wonder each year how dinner will actually appear on the table when I’ve spent the majority of the day pursuing Reynard rather than chopping, searing, sifting, mixing and tossing ingredients for the big meal. My system includes all these things, except they’re thrown into a lump category called juggling, since it is my unshakable belief that horsefolk (particularly if they hunt) are endowed with the extraordinary ability to perform 12 tasks simultaneously (I didn’t say perfectly), so that going hunting on a holiday never poses any particular problem. Now, I do not go hunting on Christmas Day for three reasons, First, we have the traditional huge family Christmas breakfast, for which I must be present and working; second, it takes several hours for everyone to open the 4,000 presents under the tree; and third, the master doesn’t take hounds out on Christmas Day. My husband feels the third reason is the real clincher as to why I stay home. But on Thanksgiving Day, I feel my only obligation is to get dinner on the table by evening. Following a rather simple formula, I’ve found this can be done without having to sacrifice a moment’s foxhunting. Preparing a turkey dinner and preparing to foxhunt on a major day can be combined without suffering nervous collapse. To begin with, if you’ve been an ardent foxhunter for a long time, your immediate family at least will understand that you will be absent from home from morning until mid-afternoon (or whenever the fox returns to his den for his turkey dinner). They don’t doubt for one moment, however, that you will have dinner simmering and baking away, ready to be consumed that evening—you and the magic little elves who obviously assist you in the kitchen. They know everything is under control, so all they have to control is their appetites as the smell of the cooking bird wafts throughout the house. You must be firm in telling other relatives and friends that while they are indeed welcome to appear at any given time during the day, they can’t expect to see you until later on. At our house there are always half a dozen people around to co-host, people who have not gone to a football or soccer game, or to pursue other self-serving pastimes such as… you guessed it. I leave out cheese and crackers, nibbles, and drinks so everyone can help themselves, which at our house is the quickest and surest kind of service available. Early Thanksgiving morning I bring my tack in the kitchen to clean, trying to combine that with some of the more mundane chores related to dinner. I do make every effort to keep the neatsfoot oil and cooking oil separate, however. Veggies simmering in neatsfoot may not be particularly palatable, although cooking oil on tack should be relatively harmless, providing one has a good seat. I soak my bit and stirrups in the sink, but I’m careful not to rinse them off too close to the salad greens in the colander next to them. My mother-in-law, who is not a horseperson, once picked my pelham bit up out of the sink and tried to squeeze a lemon with it. One can easily peel potatoes while the saddle pad fluff dries, and a true test of ambidexterity is making a cranberry mold with one hand while vacuuming a sheepskin seat-saver with the other. The same goes for the ability to fill your sandwich kit and flask while you stir the rum cake. If you should happen to spill a bit of sherry into the cake bowl, no one will ever be the wiser. In addition to self-basting turkeys, I must admit I am a great believer in using mixes. This stems partly from the fact that when I make something from scratch, it always tastes scratchy, whereas Betty Crocker, Mrs. Smith and Aunt Jemima have never let me down. Using bakery pies, rolls and breads is also useful, as they far excel my own recipes, which were inherited from my mother (who not only didn’t foxhunt on Thanksgiving, but never got out of her apron the entire Thanksgiving Day). Items that other people (or even corporations) make are extremely helpful to a foxhunting family on holidays. When someone offers to bring a dish, even if it’s tortilla chips, I say, “Oh grand, please do.” With this size family, if I play my cards right, someday I may only provide the plates and silverware. When I return from hunting, the family and friends are usually just gathering. I can then peek in at the turkey to see that he’s browning properly (he always is), and turn on various burners that will cook the already peeled or chopped ingredients in the pots. There are always several extra hands offering to set the table before dinner, and those who feel you’ve worked so hard getting dinner that they should offer to do the dishes. Again, I never say no. No matter how difficult Thanksgiving dinner is to prepare, it’s probably better than going out. I doubt many restaurants would appreciate one appearing in boots and breeches or falling sound asleep in your chair (for just five minutes) after dinner. And as all of us who enjoy the sport understand, after a day’s sport with a good horse and fine hounds, being thankful comes easy. This story was originally published in Horse Folk Are Different, published in January of 1987 by The Chronicle of the Horse.